In addition to the many products that Sweeteners Plus offers, our services support a variety of custom needs. Contract packaging opportunities in our on-site bottling facility include liquid sugars, pancake and waffle syrups, concentrates and ready-to-drink beverages. Plenty of on-site storage in stainless steel silos ranging in capacity from 10,000 to 40,000 gallons. Sweeteners Plus can create many types of custom sweetner blends using various types of liquid sugar and/or corn sweeteners to satisfy your requirements. Four stainless-steel, high-capacity liquifiers produce liquid sugars, liquid fructose and organic syrups. 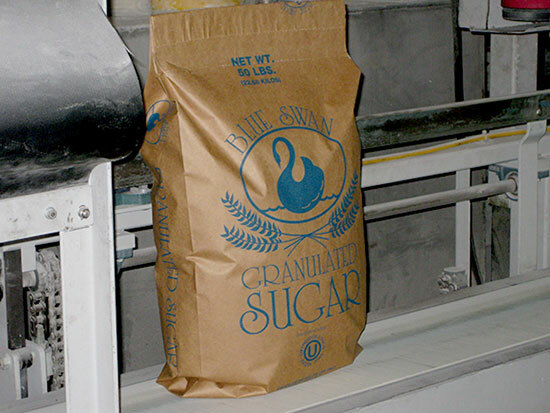 Granulated sugar is available in these sacks. Our automated tote filling machine is capable of filling to customer's exact weight requirements up to 2200 pounds. We offer smaller size packaging of granulated sugar for customers that do not need the larger quantities. Convenient package sizes are available in 1 lb, 2 lb, 5 lb, and 25 lb poly bags or boxes.